1 oz Assorted Silver Rounds | ?? 1盎司组合银圆 Introducing pure one troy ounce silver rounds. 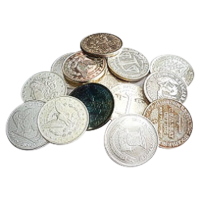 These finely minted rounds are suitable for buyers looking for tremendous value, variety and beauty in their collection. They will be our choice of available 1 oz silver rounds. Items received may be a variety of designs, or may all be identical. This product may be a mix of coins or rounds.